Watertown sophomore Shakel Inniss scored a touchdown in the game against Stoneham. 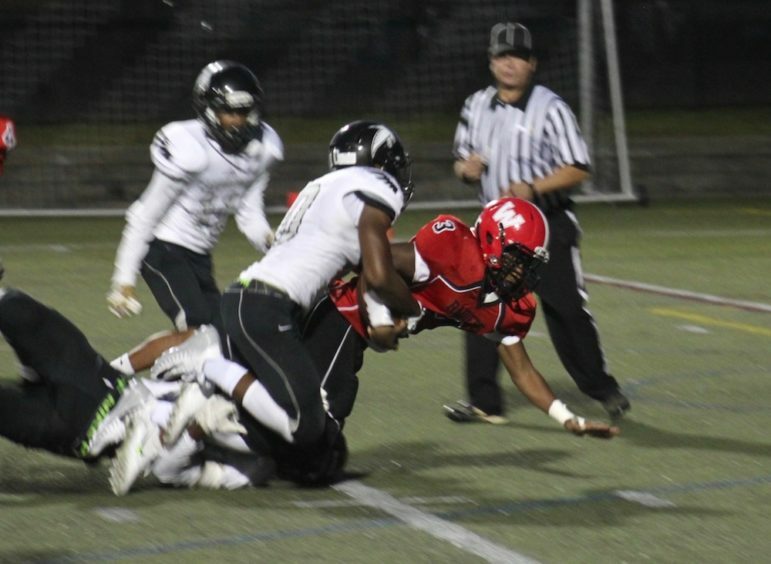 Here he carries against Cambridge Rindge & Latin. The undefeated Stoneham football team paid a visit to Victory Field Friday night, and dealt Watertown High School a 51-13 loss. The Raiders (1-5) offense struggled against the Spartans (6-0), and did not score until the fourth quarter. By that time, Stoneham had scored several touchdowns. Watertown junior Karim Monroe scored on a four yard run, but the extra point was missed. The Raiders’ second score came on a 42-yard dash by sophomore running back Shakel Inniss. Watertown is back at home to face Wakefield on Friday, Oct. 19 at 7 p.m. The two one-win teams both need a win to have a chance to make the MIAA football state playoffs in their respective divisions (Watertown Div. 5 and Wakefield Div. 4). According to the Boston Globe Power Rankings, the Raiders are ranked ninth in Div. 5 North, with the top eight making the tournament. But there are three other teams with just one one — Saugus, Bedford and Lynnfield. Saugus has a game Saturday, and the other two lost Friday night.